Vancouver Giants forward James Malm (right) shields the puck from Everett Silvertips’ Mario Mucka during Western Hockey League play at the Langley Events Centre earlier this season. Malm is one of the Giants’ leading young players. A dog really is a man’s best friend but for James Malm, the family pet also serves as his off-season training partner. “He loves it, he always comes over and tries to initiate it,” Malm said with a chuckle about his golden retriever, Toby. The course is designed for Malm to work on his puck-handling skills. With Toby, Malm will play keep-away, trying to dangle the puck through the dog’s legs. “I think it helps quite a bit for my hand-eye (co-ordination),” Malm said. And there is no denying that his offensive abilities are what have gotten Malm to this point. “He has got lots of great offensive instincts. 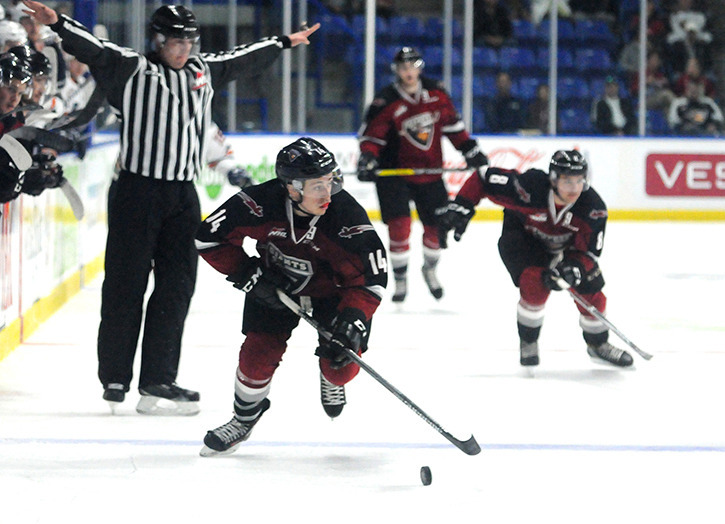 When he has the puck he can do some real good things with it,” said Vancouver Giants head coach Jason McKee. Scoring is always something which came naturally to Malm. In his final season of bantam, Malm had 70 goals and 144 points in 56 games, prompting the Giants to select him in the second round (44th overall) of the 2014 Western Hockey League bantam draft. Malm played the next season with the Valley West Hawks of the BC Major Midget Hockey League, finishing with 20 goals and 66 points in 31 games. He nearly won the league scoring title, finishing one point back of the winer despite playing seven fewer games. He made the jump to the WHL the following season but went goal-less in 25 games, registering just a pair of assists before returning to the Hawks and continuing his torrid scoring pace at the major midget level with 43 points in 18 games to finish 11th in the league. Had he played a full season, he was on pace for 95 points, which would have won the scoring title by 25 points. 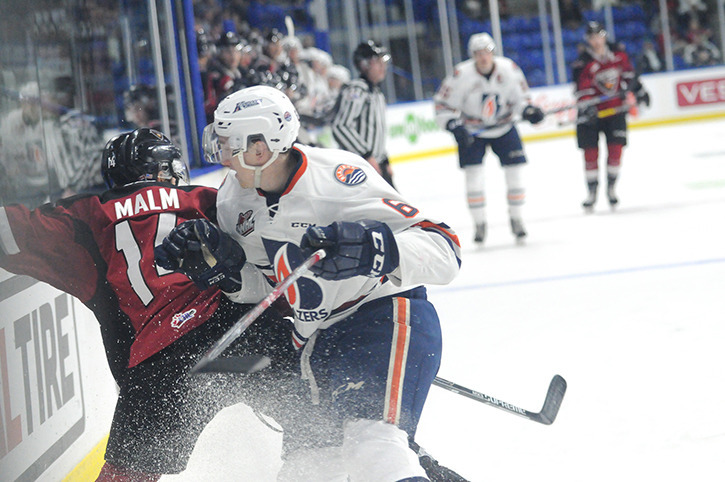 And after going scoreless in his first four WHL games this season with the Giants, Malm finally broke through in game five with not one, but two goals. “I think the first one is the hardest to get, especially since it was a while and I hadn’t gotten one,” he said. What helped was the fact that Malm wasn’t playing poorly, he just wasn’t getting prime scoring chances. But that goal sparked off some sustained production for the winger as he managed six goals and 11 points in 18 games. That coincided with a run of victories for the Giants as well, as the team rattled off 10 victories in 18 games. For the season, Malm has seven goals and 15 points while playing in 29 of the team’s 32 games. “We really felt that James’ play took off after he scored his first goal,” said Vancouver general manager Glen Hanlon. Malm’s play has earned him the opportunity to move up the Giants lineup, at times lining up with leading scorers Tyler Benson and Ty Ronning. At five-foot-nine and 180 pounds, Malm isn’t an intimidating player on the ice. But what he lacks in size, he makes up for in creativity and tenacity. He also isn’t afraid to go to the net or the dirty areas in search of the puck. 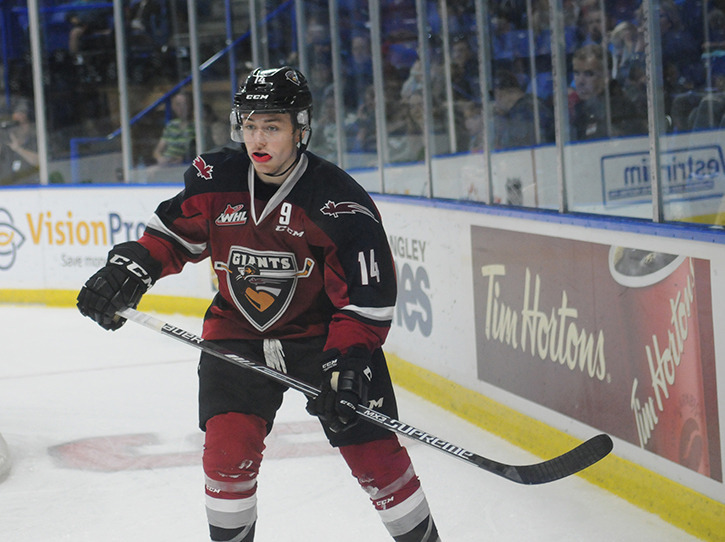 Only 17 years old — he turns 18 in June — Malm is the leading Giants scorer among the team’s 1999-born and younger players. And both Hanlon and McKee expect even bigger things down the road. “We feel he can come in and run power plays with his creativity and vision,” Hanlon said. The coach feels that once Malm — like many other young players trying to find their footing in the WHL — improves his play away from the puck, his game will grow even more. “Once he adds that part to his game he is going to be a real explosive offensive player I believe,” McKee said. “When he has (the puck) he tends to do some pretty darn good things with it but you are not always going to have the puck at this level, you are going to have to work to get it back. The Giants are back in action Friday (Dec. 16) as they host the Portland Winterhawks. Game time is 7:30 p.m. and it is Hyundai Teddy Bear Toss Night with fans encouraged to throw stuffed animals to celebrate Vancouver’s first goal. All of the teddy bears collected will be donated to the Lower Mainland Christmas Bureau.